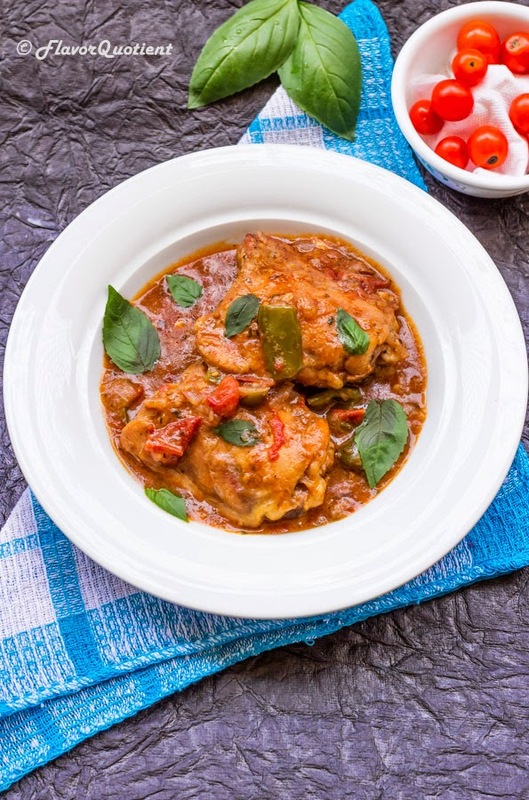 The famous Italian chicken cacciatore from an Indian kitchen! I will be honest to you. I never had any intention to make this dish but only did it for my dear husband! And I am so glad I did that – thank you darling! 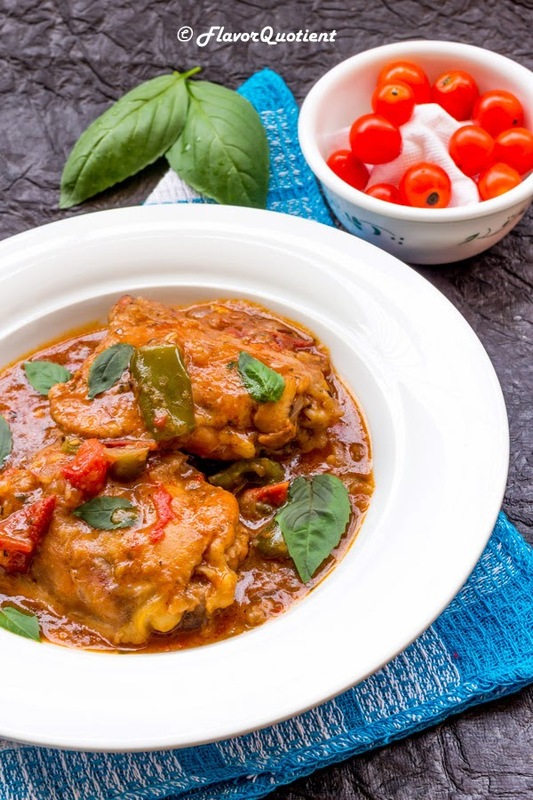 Yes, you would also be thankful if you make this classic Italian recipe as it is just too flavorful to miss! Being a spice-lover as a typical Indian, I thought this would not suit my taste-bud; but I was so wrong! 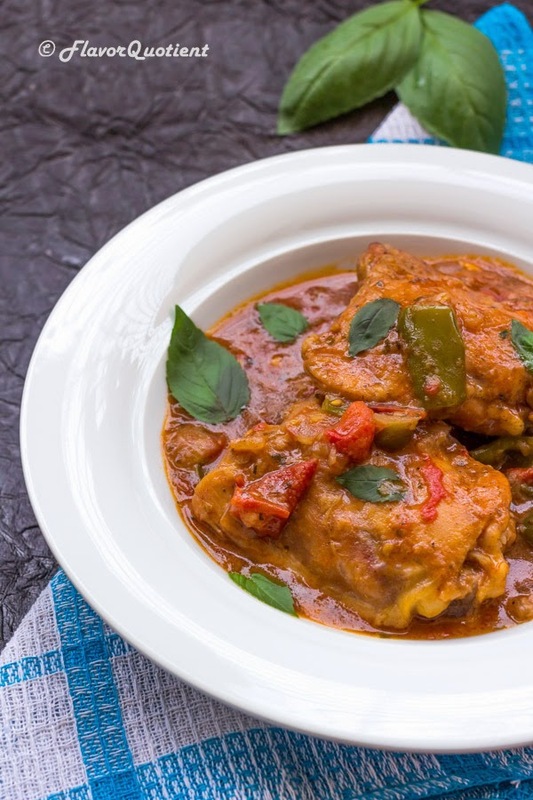 Though I gave a bit of my twist to add a zing of heat by adding couple of green chilies, but even without that this preparation will always be a winner! 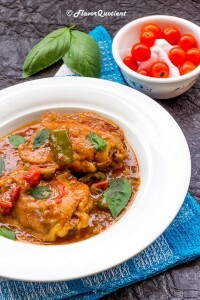 I am reading about Italian cuisine for some time now and just love their passion for good food. No wonder why they dominate so much over the world cuisine! I wish to visit Italy some day and experience their food ‘live’! During my short stay in Athens, I was lucky enough to try many Mediterranean delicacies and liked them a lot. The main thing which I liked about Greek cuisine is their wide use of olive oil and as well as olives. These green little wonders are powerhouse of nutrients and goodness for our health especially for heart and I love their tangy-sweet taste too! If you are also a newbie in making Mediterranean food like me, just follow few simple rules to avoid any disaster. Rule #1 – Always use a good quality olive oil. Rule #2 – If using any kind of wine – red or white – use the one which you would prefer to drink too. If the wine is not good for drinking, it is not good for cooking too! Rule #3 – Use the freshest possible vegetables for any kind of Mediterranean recipe. These are some basic guidelines which I follow and so far have been able to produce good results which are liked by my family a lot; hope you will like it too! 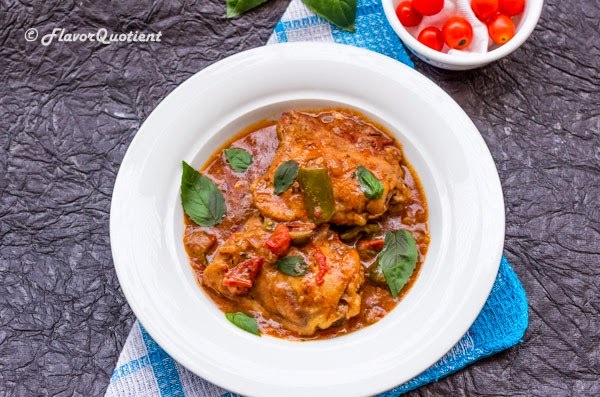 Here is my today’s recipe of chicken cacciatore. Break the eggs in a shallow bowl and whisk lightly. Wash and dry the chicken pieces. Add salt and pepper and smear all over. Spread the flour on a plate. Take one chicken piece at a time, dip it in the egg, then lay it on the flour to coat both the sides. Heat the oil in a large sauté pan or Dutch oven. Fry the chicken pieces until they are browned on both sides. Remove from pan and set aside. Add the chopped onion, minced garlic and bell pepper to the pan and sauté until the onion is browned. Add the tomatoes and green chilies. Cook until tomatoes are all mushy and broken. Now return the fried chicken pieces to the pan. Add red wine and dried basil. Add salt and pepper to taste. Add 2 cups of water and let it boil on high heat. Once the water comes to boil, cover and simmer for 40 minutes or until the chicken pieces are cooked through. By this time the sauce will turn quite thick because of the flour coating on the chicken. Taste and adjust the salt & pepper if required. Garnish with fresh basil leaves (The ones in the pictures are fresh from our kitchen garden! :) ) and serve hot over your favorite pasta!